Sometimes when I’m riding my bike I feel like a superstar athlete. It’s not that there’s no effort involved in turning the pedals because there is. It’s more like I’m achieving maximum results from the effort I am putting in. Some people would call that “being in the zone”, others call it “flow”. 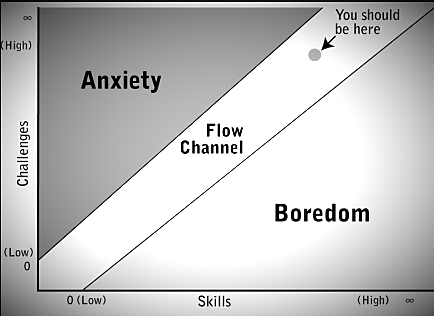 Understanding the concept of flow has helped me beat the procrastination bug many times. The definition of flow is when your ability perfectly matches the task at hand. If the task is easy for you to do, boredom will set it. We all know how hard it is to doing things that are boring. The opposite end of the scale occurs when the requirements of the task outweigh your abilities. That leaves us in the realm of “it’s too hard”. Who wants to go there? Not me, that’s for sure. I have played the guitar for many years but I recently started taking Classical guitar lessons. Up until a couple of weeks ago I avoided practicing. It was so hard to get my fingers to move in a way that resulted in a decent sound. It was especially frustrating given a) I can make a guitar sound beautiful in my own way; and b) I’m a grown up and I don’t have to do this. Facing something that is difficult is easy to avoid, especially when failing is an option. I find it helpful to beat procrastination by understanding what is going on in my brain. I can feel myself become enthusiastic when there is something that I love to do. I now realize I love to do it because it’s just challenging enough but not too much. When I don’t want to do something like vacuuming or practice the Classical guitar I now have a conversation with myself. I’m finding that those conversations are getting shorter, the items are getting crossed off the list a little faster, and there are fewer Netflix shows being watched. I do have to use this technique for exercise as well. Many people find it surprising that I don’t love exercising. Sure, once I’m out the door I’m fine, but often it takes an effort to get out the door. Does that sound familiar to you? Sometimes my plan is to do a long workout but the reality is that I’m not up to it. It’s important to remember that any amount of exercise is a good thing. I now adjust my plans based on when the feeling of “I really don’t want to” shifts to even a little bit of enthusiasm. The closer I get to finding that feeling of flow, the better off I am. It really is a neat trick.